Enemies sling hot plasma and highbrow mockery with equal enthusiasm. Imagine building a spaceship out of Legos. Now imagine this interplanetary dogfighter runs on high-octane nostalgia, shoots triple-pronged lasers and wields buzzsaws for bumpers. 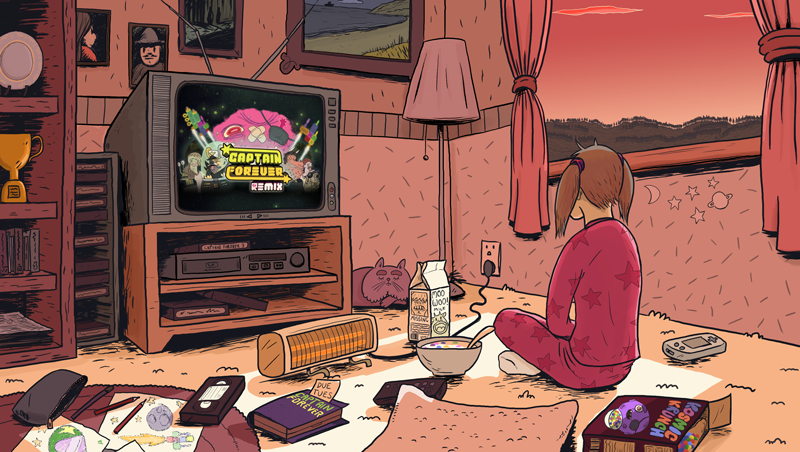 This is Captain Forever Remix. What makes it a remix? 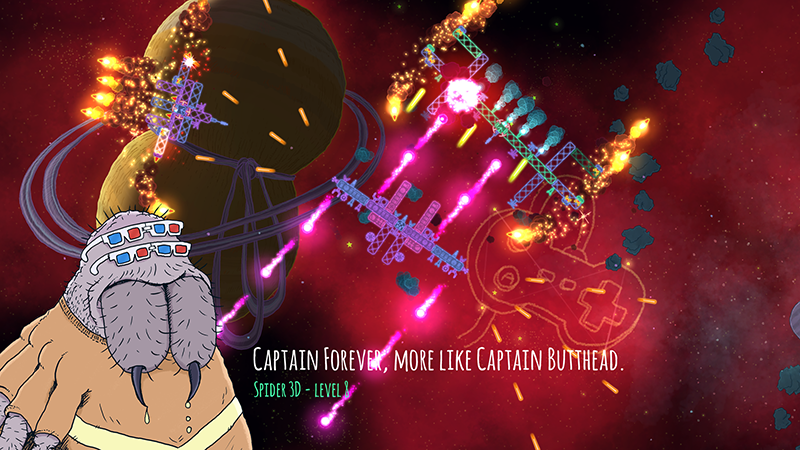 In 2009, a former 2K Australia developer named Jarrad “Farbes” Woods released a roguelike PC game called Captain Forever. For those unfamiliar with the term, “roguelike” is a popular subgenre to role-playing games identified by randomized—or procedural—design and permanent character death. Some games feature upgrade mechanics that buffer permanent death, improving statistics or unlocking new classes. This also means the game likely has a steeper learning curve than, say, Super Metroid or Shovel Knight. Pixelsaurus Games’ Dean Tate and Brian Chan, previous Harmonix employees, mention in an interview with Eurogamer’s Christian Donlan that “the idea was really an accident.” Tate and Chan pitched an HD remaster, but Woods saw that “as a burden, holding the project back,” so instead they made Captain Forever Remix. The basic concept remains: fight enemies with a spaceship, use their ship’s remains to improve yours, and repeat. The differences, though, are significant and readily welcomed. To start, there’s more of a story. The general premise involves fighting a variety of characters throughout every location while squabbling with the titular heroine’s brother King Kevin and thwarting his quest for interstellar supremacy … all because he interrupted your TV show. From that point on, it’s war. The tutorial helps with basic controls, but the bulk of the learning experience comes from experimentation. Try a new ship schematic, navigate through the cosmos like a drunken buffoon, curse the sanctity of an opponent’s mother as you explode into fiery confetti, and try again—it’s an incredibly addictive and successful formula. The controls are simple enough, but it takes some time to calibrate movement—especially in the midst of a firefight while simultaneously attaching replacement parts to the ship’s hull.